If you suffer from headaches, there is a good chance chiropractic care can help in reducing the severity and frequency! While headaches may be common, they are not normal. We can help! Headaches are very common and are often referred to as ‘normal’, however they usually happen for a reason. It is important to know what type of headaches you may suffer from because they can be very severe and have a profound effect on your life. Did you know that the pain resulting in a headache actually stems from the blood vessels, arteries, and nerves? When these are pulled, stretched, compressed, irritated, inflamed or infected, headaches will often result. Over 20 years of research has shown the relationship between the spine and many types of headaches, all of the nerves in the body stem from the spine. If you suffer from headaches, you owe it to yourself to seek help. Just mention that you saw this page and your consultation is free! Tension Headaches: Pain comes from irritated or inflamed soft tissues around the neck and head. The muscles, nerve endings, and their connective tissues can develop into trigger points (knots). Migraine Headaches: There is no clear cause of a migraine headache, only a variety of symptoms. Migraines usually are preceded by a warning sign of; nausea, visual or speech disturbance, numbness, or dizziness. Because of this undefined origin, we can treat migraines with a multitude of services to cover any potential source. Cluster Headaches: These come in spurts throughout the day, typically lasting 30-45 minutes. Customarily they can wake you after a few hours of sleep, usually within the same time period each year (spring and fall or winter and summer). Cluster headaches can last anywhere from a few days of recurring headaches, to weeks, or even months. 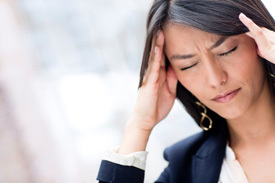 Organic Headaches: These can be caused by a wide variety of intracranial disorders. Organic headaches encompass sinus, caffeine withdrawal, and hypertension headaches among others. Unfortunately we can not cure all here, but we can provide relief from organic headaches caused by TMJ dysfunction, pregnancy, and reading (if it is not vision related). Cervicogenic Headaches: These are secondary headaches, meaning they are caused by physical issues or illness. Physicals issues could consist of subluxation (misalignment) of the spine. This could also include muscle spasms or nerve irritations within the neck. Rebound Headaches: These can occur due to misuse, abuse, or dependency of over the counter painkillers or NSAIDs (non-steroidal anti-inflammatory drugs). Our goal is to control your headaches with adjustments to maintain alignment and reduce the risk of headaches.